Old habits die hard, like combining Chocolate and Raspberry. Yes, I've done it so much, it qualifies as a habit. Mmm.... so delicious. And thanks to the infinite possibilities of pastry, there are virtually no limits to how that classic combo can be constructed. Continuing my recent run with Tarts (have I ever mentioned how much I like Tarts? ), I decided to bring this happy duo together in a Bavarois or Bavarian Tart. A Bavarian is a dessert cream comprised of a base (typically a Creme Anglaise or a Fruit Purée) that is combined with Gelatin and Whipped Cream (Creme Fouetté). By all measures, it's a relatively easy filling to make for a Tart. The only tricky part is properly combining the Bavarian Base with the Whipped Cream. For the two ingredients to fold together smoothly, they need to be of similar temperature and consistency. Get that right (keep reading for some tips), and you'll have an extremely satisfying dessert on your hands! While I have a particular weakness for Raspberry, a Fruit Bavarian Tart can be made with any Fruit Purée - just swap out the Raspberry Purée in this recipe with your Fruit Purée of choice. However, consider adjusting the amount of Sugar added based on the natural sweetness of the Fruit Purée you select. If you worked in a Patisserie, you would likely have a ready supply of miniature Tart Shells at your disposal. For the 99.9% of you who do not, the first step is making a recipe of Pate Sucree, rolling out the dough, molding a bunch of Tarts and blind baking the Tart Shells (since this is an unbaked filling). One recipe (480g) of Pate Sucree is sufficient for six 4" miniature Tart Shells. Prepare and blind bake the Tart Shells at 350 degrees Fahrenheit (177 degrees Celsius) until they are golden brown - approximately 15 - 20 minutes. While it typically is not recommended to dock a Tart Shell that will be finished with a liquid filling, the Raspberry Bavarian Filling is sufficiently thick so that it should not seep through any docking marks. Set the baked Tart Shells aside to cool. They can be blind baked in advance and stored at room temperature for 2 - 3 days wrapped in plastic wrap. Melt and temper Dark Chocolate, and then coat the inside of the baked Tart Shells with a thin layer of Chocolate using a pastry brush. Set the Chocolate coated Tart Shells aside to set. Coating the cooled Tart Shells with a thin layer of Tempered Chocolate serves two purposes. Yes, it is a delicious surprise under the Raspberry Bavarian Filling. But it also serves a practical purpose - it keeps the Tart Shells crisp. 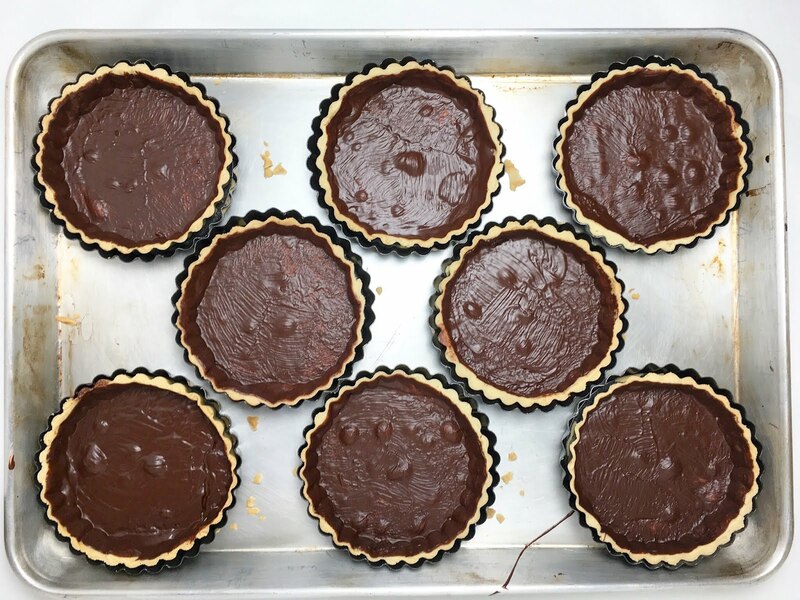 By coating the Tart Shells in Tempered Chocolate, the filled Tarts will keep well for 2 - 3 days. Without the Tempered Chocolate, they would become soft and soggy with time. 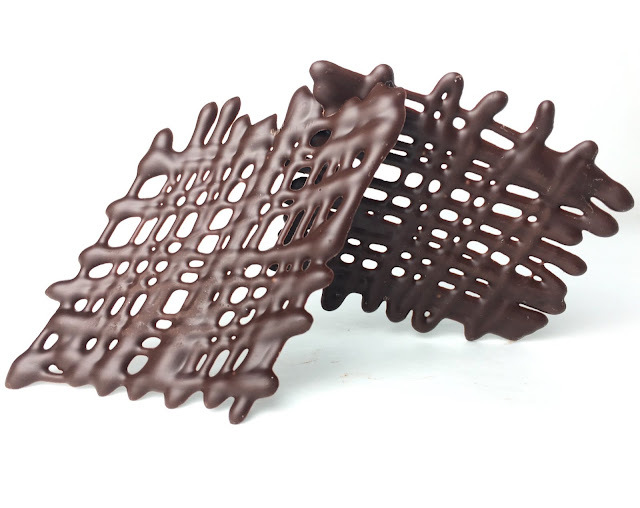 Tempered Chocolate can also be used to create a variety of Chocolate Garnishes. 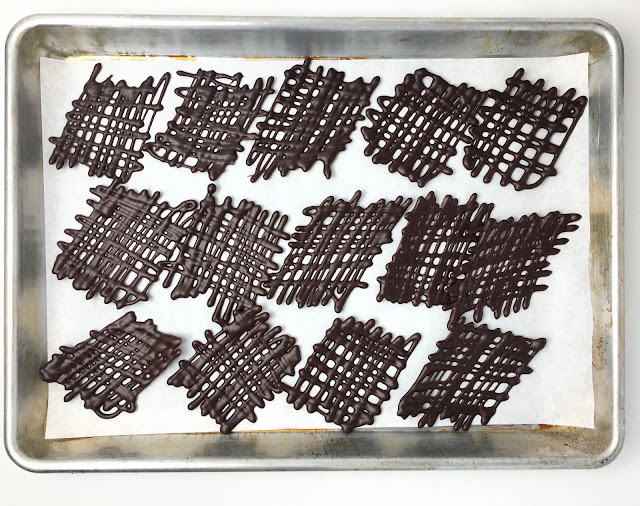 By simply drizzling Tempered Chocolate in a zig-zag pattern onto a parchment lined sheet tray and allowing the Chocolate to set, you can quickly create perfect Chocolate Garnishes for these miniature Tarts. The Chocolate Garnishes should only be made with well-tempered Chocolate. If the Chocolate is not tempered, the Garnishes will be soft and sticky at room temperature and will be difficult to handle. The Raspberry Bavarian Filling has two primary components: a base, made from Gelatin stabilized Fruit Purée, and Whipped Cream (Creme Fouetté). To prepare the base, first place the Gelatin Sheets in cold water to bloom. Unbloomed Gelatin will not dissolve properly. As the Gelatin blooms, gently heat the Raspberry Purée over medium heat with Sugar until the Sugar dissolves. Once all of the Sugar has dissolved, remove the pot from the heat and transfer the Fruit Purée Mixture to a large mixing bowl. Squeeze out any excess water from the Gelatin sheets and stir the Gelatin into the warm Fruit Purée Mixture until it completely dissolves. Set the Gelatin stabilized Fruit Purée aside to cool, stirring occasionally. The Gelatin will begin to set and thicken as the mixture cools. If that mixture is particularly hot, you can accelerate the process by briefly placing the mixing bowl over an ice bath. 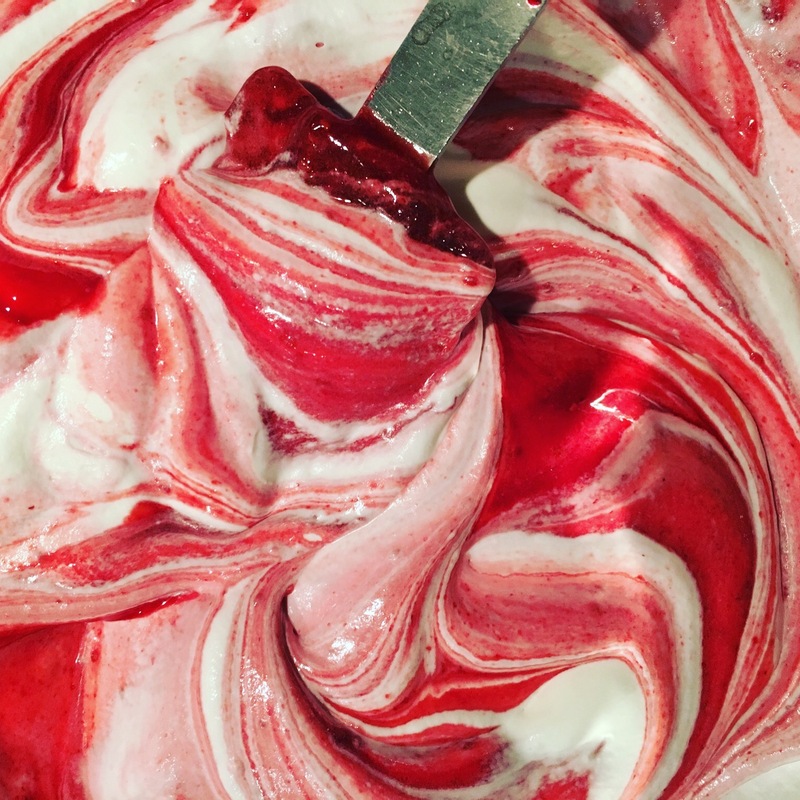 As the Gelatin stabilized Fruit Purée cools and begins to set and thicken, whip the Cream to medium-to-stiff peaks. Once the Gelatin stabilized Fruit Purée has cooled to room temperature and has noticeably begun to set (it should start to look like a thick syrup), sacrifice (i.e. stir in) a bit of the Whipped Cream into the Gelatin stabilized Fruit Purée to begin making the Fruit Bavarian Filling. Next, fold half of the remaining Whipped Cream into the Fruit Bavarian Mixture, taking care to work gently and not deflate the Whipped Cream. While the Fruit Bavarian Filling is still streaky, add the remaining Whipped Cream, and fold the mixture until it is completely homogeneous. There are several important considerations to keep in mind when folding the components (i.e. the Base and Whipped Cream) together. If the Gelatin stabilized Fruit Purée is still warm, it will quickly deflate the cold Whipped Cream when the components are folded together. Even if the Gelatin stabilized Fruit Purée is cool, if the Gelatin has not yet begun to set, the mixture will be too liquid and will cause the Whipped Cream to deflate. The bowl of Gelatin stabilized Fruit Purée can be briefly placed over an ice bath to help accelerate the cooling and setting process. If the Gelatin stabilized Fruit Purée has set too much and is too thick, it will not be possible to smoothly fold it with the Whipped Cream. The resulting mixture will be lumpy. The Gelatin stabilized Fruit Purée can be thinned by briefly and gently heating it over low heat. Once the Gelatin Stabilized Fruit Purée and Whipped Cream have been folded together to create the Raspberry Bavarian Filling, immediately fill the Chocolate-lined Tart Shells. 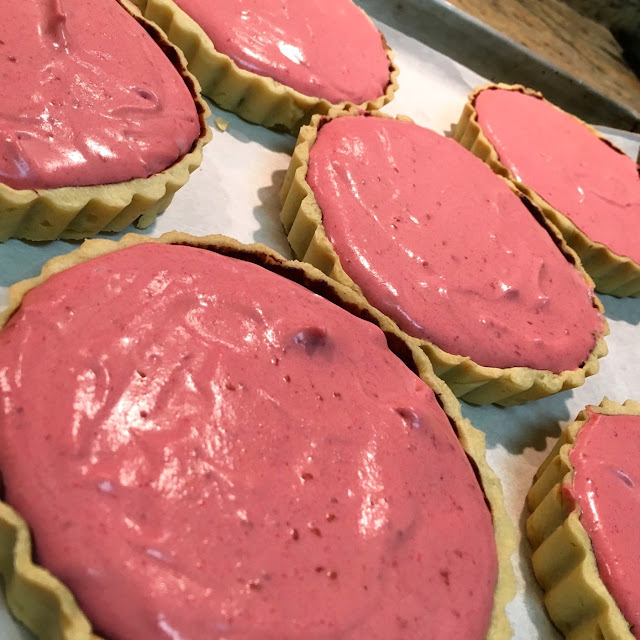 The Raspberry Bavarian Filling should be just fluid enough so that it can easily and neatly be poured into the Tart Shells. Gently tapping the sides of the Tarts will help evenly distribute the Raspberry Bavarian Filling and will smooth the surface of the Tarts. Place the Tarts in the refrigerator to fully set for at least 30 minutes before serving. Serve the Tarts with a quenelle (or dollop) of Whipped Cream and one of the Chocolate Garnishes. 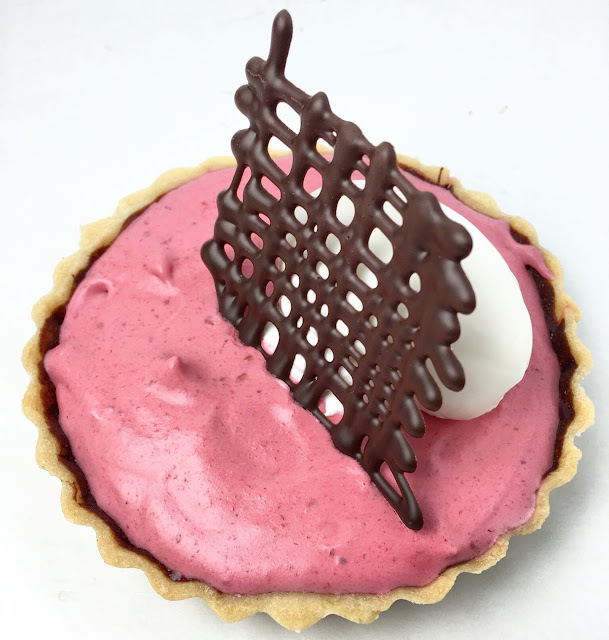 The Chocolate & Raspberry Bavarian Tarts are best served the day they are made, but they will keep well for 2 - 3 days when stored in an airtight container in the refrigerator. * Note on Ingredients: Various Fruit Purées are readily available. However, you can easily make a Fruit Purée in a blender or food process using either fresh or frozen Fruit (primarily Berries). Straining the blended Purée is an optional step - some people like to have the texture from seeds while other prefer a smooth filling. 1. Prepare the Pate Sucree and let it rest for at least an hour (ideally overnight). Roll the Pate Sucree and form, dock and blind bake the Tart Shells. Set the Tart Shells aside to cool. 2. As the Tart Shells cool, melt and temper the Dark Chocolate. 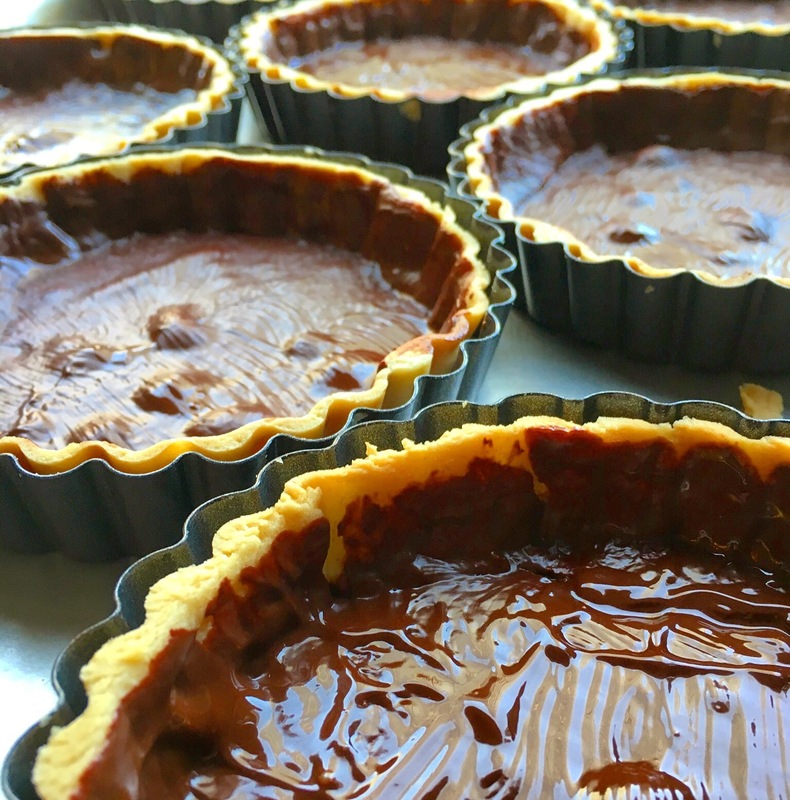 Apply a thin layer of Tempered Chocolate to the inside of the Tart Shells using a pastry brush. Set the coated Tart Shells aside to set. Chef's Note: Any remaining Tempered Chocolate can be used to make Chocolate Garnishes for the Tarts. 3. Bloom the Gelatin Sheets in cold water. As the Gelatin Sheets bloom, gently heat the Raspberry Purée and Sugar in a pot over medium heat until the Sugar is dissolved. Remove the pot from the heat. 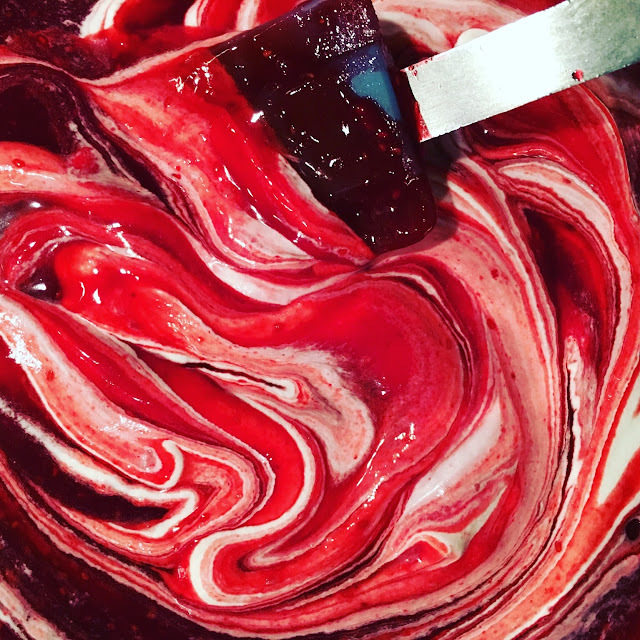 Transfer the warm Raspberry Purée Mixture to a large, metal mixing bowl. 4. Squeeze any excess water from the Gelatin Sheets and stir them into the Raspberry Purée Mixture until they are fully dissolved. Set the Gelatin Stabilized Purée aside to cool and set, stirring occasionally. 5. As the Gelatin Stabilized Purée cools, whip the Cream to medium-to-stiff peaks. As soon as the Gelatin Stabilized Purée is cool and has noticeably thickened, sacrifice (i.e. stir in) some of the Whipped Cream into the cooled Gelatin Stabilized Purée. Next, fold half of the remaining Whipped Cream into the Purée mixture, taking care to work gently and not deflate the mixture. While the Raspberry Bavarian Filling is still streaky, fold in the remaining Whipped Cream until the mixture is completely homogeneous. Chef's Note: The Gelatin Stabilized Purée can be placed over an ice bath to speed the cooling and setting process. If the Gelatin sets too much, the mixture can be gently reheated over low heat. 6. Immediately fill the Tart Shells with the Raspberry Bavarian Filling. Gently tap the filled Tarts to evenly distribute the Filling and to smooth the surface. Place the Tarts in the refrigerator to fully set for at least 30 minutes before serving. 7. Serve the Tarts with a quenelle of Whipped Cream and a Chocolate Garnish. 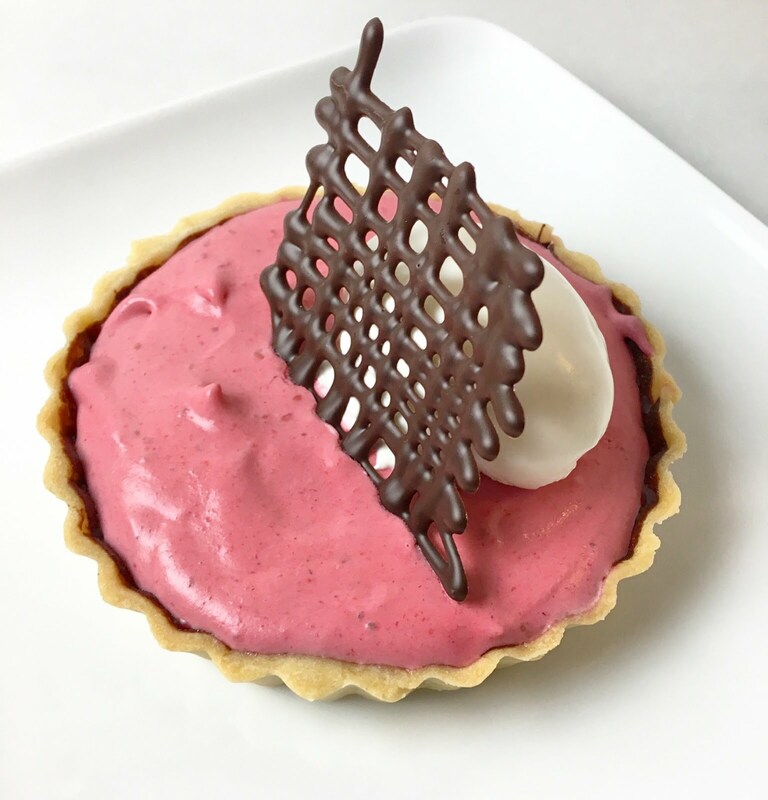 - The Chocolate & Raspberry Bavarian Tarts are best served the day they are made, but they will keep well for 2 - 3 days when stored in an airtight container in the refrigerator.